Custom pavers, which make up the floor of the Plaza, were selected providing for larger sizes to engrave your name, date(s) of graduation or to commemorate milestones and to memorialize or honor treasured individuals. Become a Milestone Supporter to build a stronger University and have your name etched on Dennard Plaza. The center of the plaza, Founders’Commons, is reserved for alumni of our legacy institutions. Reserve your brick or paver NOW by completing the online form below or the printable PDF flyer/reservation form. 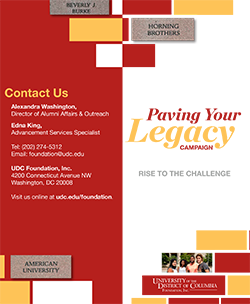 We invite all alumni, students, faculty, staff and friends to reserve your brick or paver.